Once again, another week has flown by. It's been a week of mixed emotions for me which always seems to happen as the time draws nearer to my six month check up including CT scan and blood work followed closely by appointments with my family doctor and oncologist for the results. It all starts this Wednesday with an x-ray and bone scan and then another CT scan a couple of weeks later. The apprehension and waiting is the difficult part. But on a brighter note, I try to keep both my hands and mind occupied. We've had such a cold and wet Spring that the yard work is no where near done. When I look at photos from the last two years at this time, it would appear that we are about three weeks behind. Having said that, things have started to green up nicely and the perennials and Spring-blooming trees and shrubs are slowly coming to life. We mowed the front half of the back forty yesterday. The back is just too saturated with water to be be able to drive the tractor over it without getting stuck. And how do I know this? You really don't want to know the answer to that. It's a gorgeous day today here in paradise. The sun is shining, the sky is blue and it's a great day for drying freshly washed bedding on the line. The rhubarb and chives survived the winter in the kitchen garden just outside our back door. I can't wait for the weather to warm up so that I can put my tomatoes and peppers in. are becoming larger with each passing day. I finished another mini flimsy this past week to get some practice on my new machine. I haven't decided whether I'm going to hand or machine quilt this one but it'll probably get done sometime this week. And no week would be complete without some shopping thrown in for good measure...right? No shopping trip would be complete either without a few yards of fabric to add to my stash. And how about a couple of new rulers and some thread? While the clothes were out drying on the line, I decided to make a quiche for lunch. Here's the recipe if you'd like to give it a try. It's easy-peasy to prepare and is delicious. I usually serve ours with a salad but we were both too hungry to wait until I made one. Preheat oven to 425 degrees. Beat eggs until frothy. Blend in cream. Layer ham in bottom of pie shell. Sprinkle mushrooms, onions, and cheese on top of ham. Add salt and pepper to egg mixture. Set pan on baking sheet. Carefully pour egg mixture into pie shell covering ham and cheese. Bake 10 minutes at 425 degrees; reduce temperature to 325 degrees and bake 30 minutes or until quiche is set. Serve hot. This will make 2 pies or approximately 12-14 servings. NOTE: I altered the recipe slightly by first spreading dijon mustard over the entire bottom of the pie shell and also sauteed the mushrooms, ham and green onions in about a tablespoon of olive oil before layering them inside. I didn't partially bake the pie shells either and they turned out just fine! 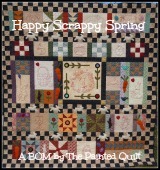 Just a reminder that this coming Wednesday is the 1st of May which means that the second of six instalments of my Happy Scrappy Spring BOM will be available for you to download. 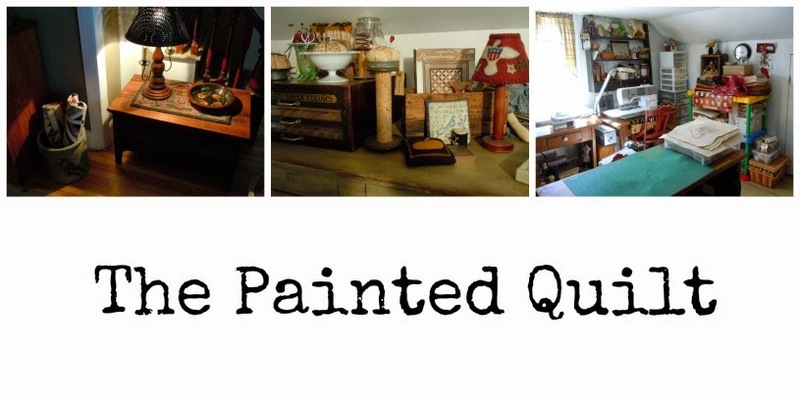 I also have a Flicker Gallery that you can access from the right sidebar of my blog if you'd like to upload some photos of your progress. I'd love to see what you've all been doing! Ollie and Frankie would like to have a peek as well...when they're not snoozing, of course! A week has passed since my last post. I know I must sound like a broken record but where does the time go? I think most people who are fortunate enough to have a "hobby"...as most of us who have found their way here do...find that we are never bored. I know I'm not. I always manage to have some kind of project on the go to keep me busy and to occupy my mind. This past week I got my Grandmother's Flower Garden quilt ready to send off to my friend Alice to be custom quilted. I'm so excited to see what magic she's going to perform and as always, she has "carte blanche" to do whatever strikes her fancy. I also started and completed my April mini challenge quilt on Kathleen Tracy's Small Quilt board. Kathy challenges us to complete a small quilt of her choosing every month, usually from one of her books or freebie patterns. This month she provided us with the Contrary Wife block from which we were to create a small or mini quilt of our choosing. On Wednesday of this week I completed the hand quilting and binding of mine. And the back, complete with my personalized cotton twill label. Yesterday was another full day. 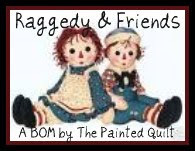 My friend Debra (no blog) and I went to our NSL (Not-So-Local) quilt shop where we purchased our Husqvarna machines for further instruction. Debra has a Husqvarna Ruby which is a combination domestic and embroidery machine that she purchased not too long before I purchased my Sapphire 735. This was my second lesson and I feel so much more confident now when using it. I started piecing another mini quilt while at the class yesterday and everything went very smoothly and my 1/4" seams were bang on! Yippee! In a typical friendship, friends will do favors for each other without expecting anything in return. Just last week Debra, Nora (another quilting friend) and I were talking about manicures and pedicures and the fact that we hadn't pampered ourselves in a VERY long time. On our way back home yesterday, Debra surprised me with a gift...a pedicure at a local spa! I can assure you that my ugly feet will never be used in a foot commercial but let me tell you that I feel so elegant with my red-painted toe nails and oh sooooooo smooth soles and heels. Aw, come on. You promised that you wouldn't laugh! And guess what? We both booked an appointment to return next month! When I arrived back home yesterday, Frankie just couldn't help himself from checking out what was in my sewing basket. Ha, ha! No room for you in here, Ollie! Finish! Well, not quite...but a flimsy for sure. It's been four years in the making and I knew when I started that it would be a V-E-R-Y long WIP. I didn't honestly think that it would take this long but I do have some valid excuses like a long distance move and a blip on the cancer radar during that time. 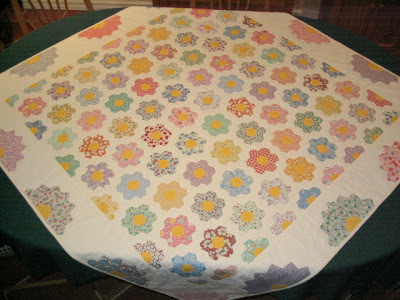 The inspiration for my Grandmother's Flower Garden quilt came from this antique one that I purchased about ten years ago on one of my travel teaching trips to Ohio. There was cool General Store in Hudson, Ohio that was closing and the owner was selling off her personal collection of antique quilts the day my friend and I happened to stop by. The GFG is one of two quilts that I purchased that day...the other is a red and white one. And just to keep things in perspective, this was about four years before I retired and decided to teach myself how to quilt. The original GFG quilt is hanging from the upstairs restroom door. It is signed and dated 1923, so it is 90 years old and in virtually pristine condition. 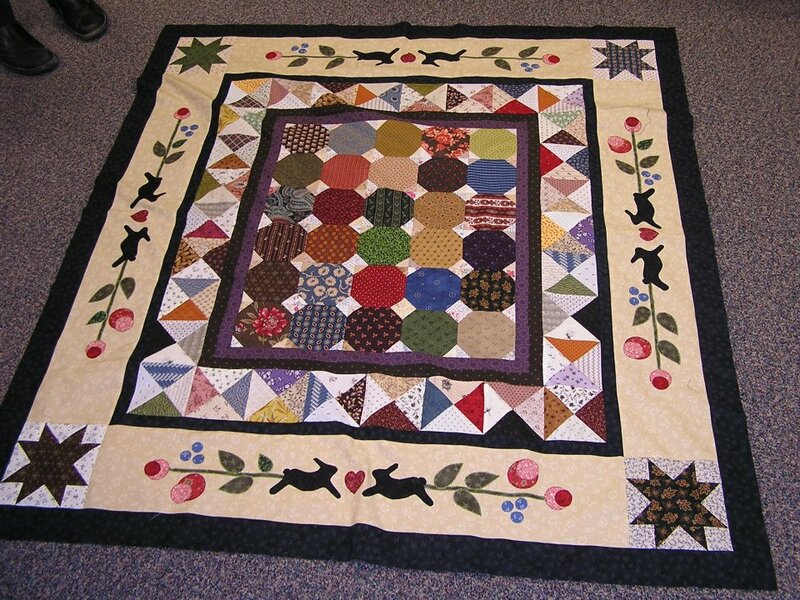 This is the quilt from where I garnered the inspiration to make mine. I wanted it to resemble this one as closely as possible. and the shorter sides were bound around the outer hexie shape shown in the photos above and below. I spent a very restless night thinking about it. Trash it or try to save it? If the truth be told, I honestly came very close to chucking it in the trash but decided to see if you all had any suggestions as to how I might salvage it. I posted about my dilemma here and mentioned that I had a Plan B.
I believe it was the very next day that Laurel (no blog) sent me this photo that she had saved from Pinterest as her inspiration for when the time came to make her own GFG. 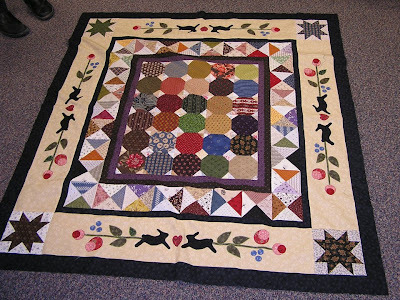 The quilt was made by Julia from Julia's Place. In my mind, this was so similar to my "Plan B" and I fell in love with it. Isn't it exquisite? Admittedly, I was very despondent that my original plan would not come to fruition without some additional long and tedious hours which after four years of on-and-off work was just not going to happen. When I saw Julia's quilt, a calm came over me and I knew that my Plan B was going to be alright. Thank you, Laurel for sharing Julia's beautiful interpretation of a GFG...and thank you, Julia for making it. And here is my Plan B. And another close up of the 3" hexagon flower that I hand appliquéd in each of the four outermost cornerstones. I am happy to say that I am thrilled with the final outcome...and I know that I'll be even more over-the-moon happy after my friend Alice adds her magic quilting to it. Is it just me or do the days pass by more quickly as you get older? One day just seems to lead into the next and it seems like in the blink of an eye, another week has gone by! 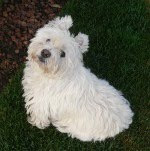 If we didn't have to take Ollie to the beauty shop this morning we would have been outdoors working in the yard. What a glorious day here in Paradise the Annapolis Valley of Nova Scotia. The sun is shining, the temperature is in the 50's and there were people golfing at the course just up the road from us. I think that Spring has officially arrived! Move over, Frankie. You're hogging the carpet! His trip to the spa really tuckered him out. Wake me when it's time for dinner...zzzzzzz. because I really couldn't be without one. I also came across this gadget which I've never seen before...a mini vacuum cleaner that runs on 2 "AA" batteries. I figured at $12.99, it wouldn't break the bank even if it didn't do the job. It even comes with a couple of attachments to get into those hard-to-reach places in the bobbin housing. I'm going to blame the mishaps(s) that I had with my iron due to the fact that I was stressed out. 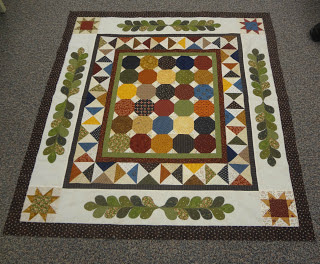 The third instalment of Darlene's mystery quilt involved machine applique...something I've never tried before. You all know how much I love hand work so machine applique was something that I had never given much thought to. I changed it up slightly and designed my own border with bunnies, folk art-y roses and berries which I did affix to the fabric by machine using the blanket stitch. It wasn't as difficult as I thought it would be and discovered that it is much the same as hand applique, only it was the machine that was doing the stitching and it was me who was driving the machine and steering the fabric. I did learn a few things as I went along and I can definitely see myself using machine applique in some of my future designs. My Grandmother's Flower Garden is coming along nicely. I've been diligently working on it over the last couple of weeks as well and should have the completed flimsy to show you in my next post. Y'all are going to be surprised!